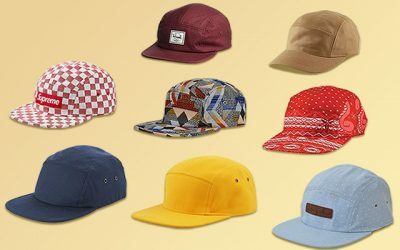 The summer is coming and it is time for you to update your wardrobe, including your hat collection. 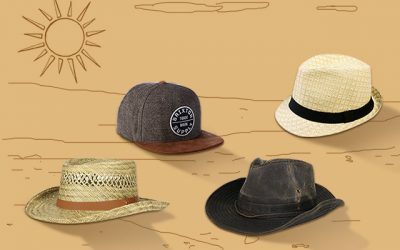 And in term of summer clothing and accessories, one of the most important things that a man should buy is undoubtedly the straw hat. 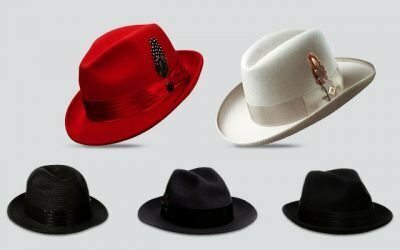 For a complete guide to men’s summer hats, you can follow this link https://thebesthat.com/complete-guide-mens-summer-hats/. 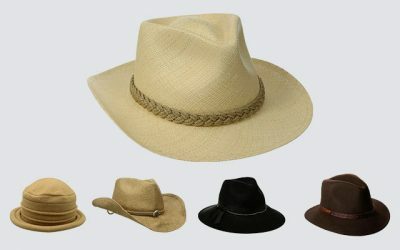 Since the straw hat is one of the most popular hats for men in the summer, you have thousands of choices to choose from. This collection below shows you the trendiest and most popular straw hats. They are different in styles and designs and you will surely find the one that you like here. Its Main Features: This novelty hat features the design of a tatty stray hat with frayed design. It is made from 100 % of straw with the natural color. Pros: The first thing that I noticed about this hat when I purchased it was its high quality construction. It is well crafted for a firm and sturdy body for extra durability. And with such a firmness and sturdiness, the brim wouldn’t become floppy when there is a big wind. Not to mention that this hat brings a right amount of shade to me. Not too little that I get sunburn but not too much that it covers my face. The natural straw brings a very natural and fresh look to the hat itself. 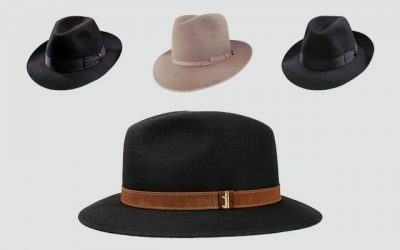 With the neutral look, it is easy for you to pair this hat with other pieces of your clothes. Cons: This straw hat only comes in 1 size and 1 color for you to choose from. In addition, the straw is a little bit tough. When To Wear This Hat? This novelty hat is ideal for cowboy or farmer fancy dress. It is suitable to wear to any costume party or Halloween party as well. Its Main Features: This cowboy straw hat is made of synthetic material. With this kind of western straw hats, you can have many choices of colors and pattern- from black, white, brown, to golden. It also features the twine hatband with metal buckle and beads. Pros: First of all, the material of this hat makes it very breathable and well-ventilated. You will not feel hot or irritated at all in the summer. Second of all, the straw of this hat is not so thick or not so soft. As a result, you can easily shape the hat to the shape that you like and it will hold its shape throughout a very long time. This hat also has a wide brim that helps to cover a part of my face when I go out. 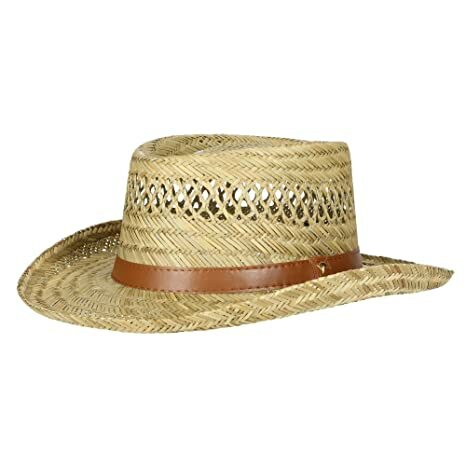 And last but not last, like any other high quality straw hats that you can find on the market, this straw hat is well made with an excellent craftsmanship to last for a very long time. Cons: This straw hat doesn’t come with a chin strap to secure itself on your head. When To Wear This Hat? You can wear this western straw hat to a wide range of occasions- from country music concerts and western themed parties. It also goes well with your cowboy or western-inspired style. Its Main Features: This hat is made with 100 % of synthetic straw. It features a printed canvas trim and a label patch with is woven on the front of the hat. Pros: The thing that I love the most about this hat is that it comes with an adjustable chin strap. With this strap, you can wear it in a windy day on the beach and don’t have to hold it with your hand all of the time. Very convenient, isn’t it? Another thing that I like about the hat is the brim. With a soft wire running along the brim, I can easily reshape the brim of the hat to whichever style that you want. It also means that you can fold the hat and pack it insider your bag to bring with you when you go travelling. And last but not least, this hat is very light weight and comfortable for you to wear all day long. 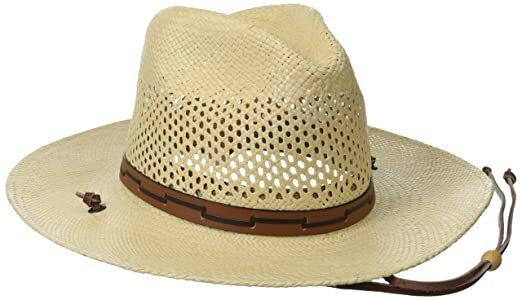 Cons: While this type of mens straw hats looks very stylish, soft and comfortable to wear, it is not as durable as the other types of straw hats. You shouldn’t expect it to last through several beach seasons. When To Wear This Hat? 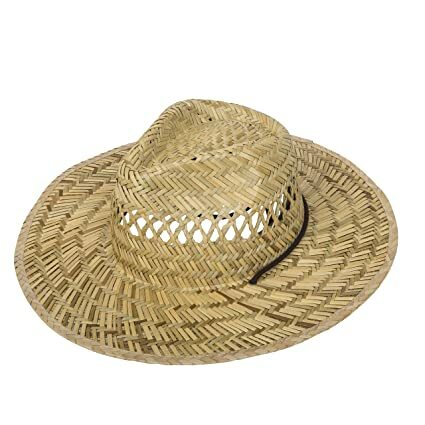 If you are looking for straw hats for men to wear for your next trip to the beach, you can consider this one. 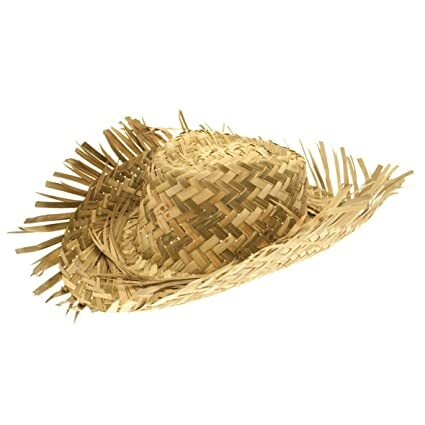 Its Main Features: This straw hat is made of 100 % of poly straw. 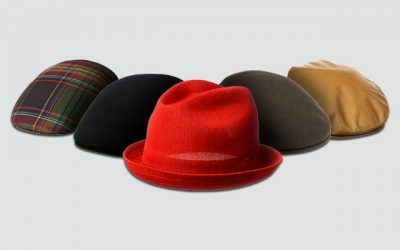 It features the design of a classic fedora hat with a chin cord. This straw fedora hat is available in many options of colors including suede, black, and navy. There are also choices of colors for women such as cranberry and caramel. 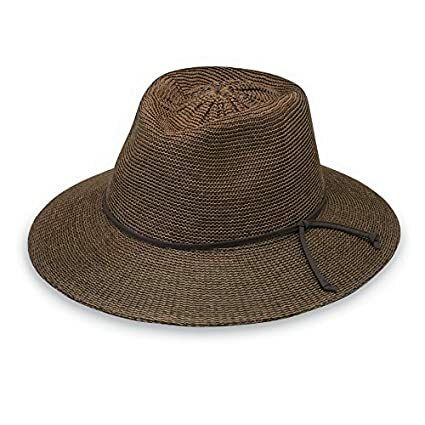 Pros: Featuring the classic and unisex style, this straw hat is a great option for men as well as women. It is available in many bright colors in case you are also searching for matching ladies straw hats. With the 3 inch round brim, this hat offers you a nice coverage for your face. Also, you will be protected with the high quality material which is rated UPF 50 +. 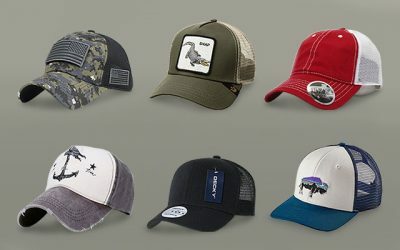 Not to mention that this hat is lightweight and breathable with high-quality straw and a cool cotton lining. Last but not least, there is an adjustable drawstring which is attached to the hat. It helps to secure the hat and makes sure you have the best and most comfortable fit. Cons: This straw hat has fabric covering the entire inside, which I don’t think would be cool and comfortable if you wear it for a long time. When To Wear This Hat? This is definitely a beach straw hat that you can consider wearing for your next summer trip. You can also wear it with your casual wear to form a casual and daily life look. Its Main Features: This type of mens straw hats is made of 100 % of natural fibers. This hat features the style of a gambler hat with a wide brim. It is available in natural color with 3 options of sizes for you to choose from including small, medium, and large. Pros: Thanks to its high quality natural fibers, this hat is very lightweight and comfortable. There is also a mesh area around the top of the hat to help ventilate air and keep your head cool all of the time. All of the details on the hat are made with an attention to details to bring a nicely made hat with no loose threads. 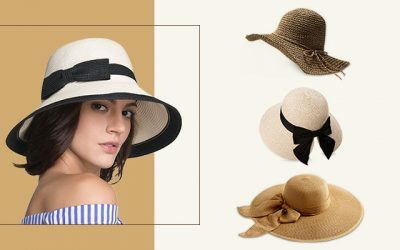 And not to mention that there are 3 sizes for you to choose from, unlike other straw hats, so that you can easily find your perfect fit with this hat. Finally, with its unique yet traditional style, this hat is suitable for both young men and elder men to wear. Cons: The fiber of the hat is a little bit stiff and as a result, this hat is not crushable and packable. When To Wear This Hat? You can wear this hat as a straw beach hat or a perfect lightweight summer hat. Its Main Features: This type of straw golf hats is made of 100 % of natural straw. It features the lifeguard sun hat style with a pinched front crown and a wide brim. The width of the brim is 4.5 inches. There are also black accents and matching adjustable chin cord. 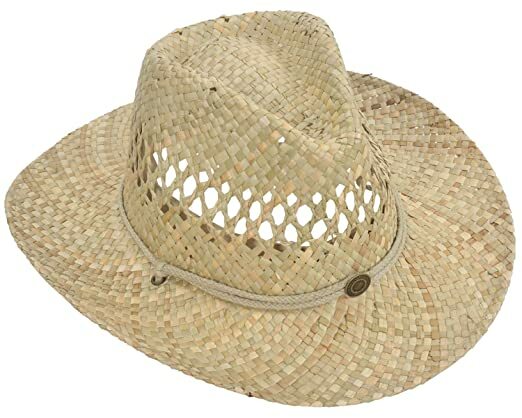 Pros: As this straw hat is made of natural straw, it is very lightweight and breathable. Not to mention that there is an interior ribbon sweatband to help wick moisture away and keep your head as cool as possible in a hot summer day. And there is a mesh area around the top of the hat to help ventilate air and keep your head cool as well. In addition, this straw hat is very lightweight. It is also foldable so that you can easily pack the hat and bring it along with you when you go travelling. 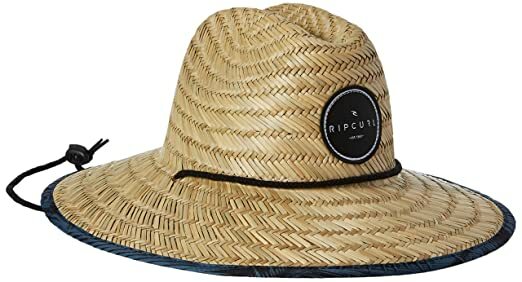 Cons: The brim of this straw hat for men can become floppy in case of a big wind. When To Wear This Hat? It goes well with your beach wear and other summer wear. You can wear this hat when you go to the beach or the pool. It does also make you look good in a summer party, that is for sure. Its Main Features: This straw hat feature a super wide brim of up to 7.1 inches with a round crown. The inside seam of this hat is 8 inches. It is available in 1 size and has a large fit. Pros: The most significant feature that you might have noticed about this hat is that it comes with a brim which is wider than any other hat on this list. As a result, it offers a great coverage, not only for your entire face but also your shoulders. 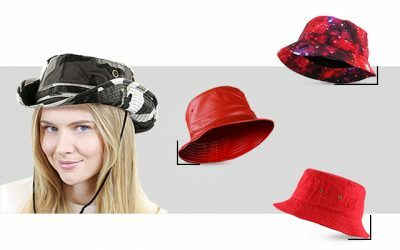 In addition, there are several ventilation holes around the hat so that it is cool and comfortable for you to wear it in a hot summer day. The brim is made with a solid construction so that it doesn’t become floppy no matter what. This hat comes with an adjustable chinstrap so that you can easily change the length to ensure that the hat stay put on your head. 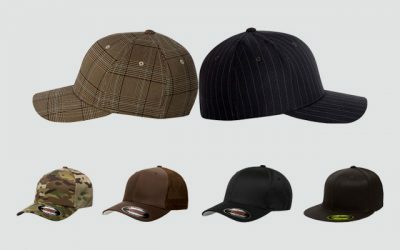 All of them contribute to make a perfect hat for outdoor work that you can wear in all kinds of conditions- rainy or sunny days. Cons: When you wear a hat with a wide brim like this, the brim might block your view. In addition, it is quite heavy and bulky to wear this hat. When To Wear This Hat? This hat is a great option for you if you need an ultimate protection from the sun such as when you go fishing or gardening. You can also use this straw hat as a lifeguard style hat at the beach and at the pool. Its Main Features: This hat is made of 100 % of natural straw featuring the classic garden hat. It features a wide unshaped brim and a teardrop crown. 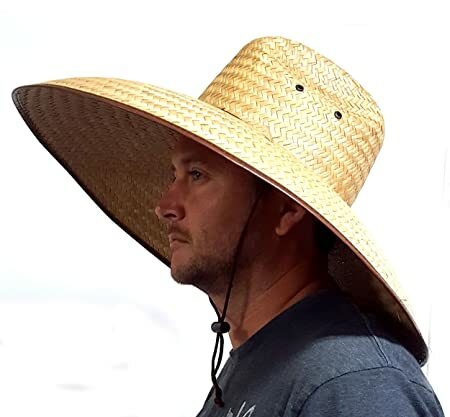 Pros: This is one of the best mens straw sun hats that I have ever used. 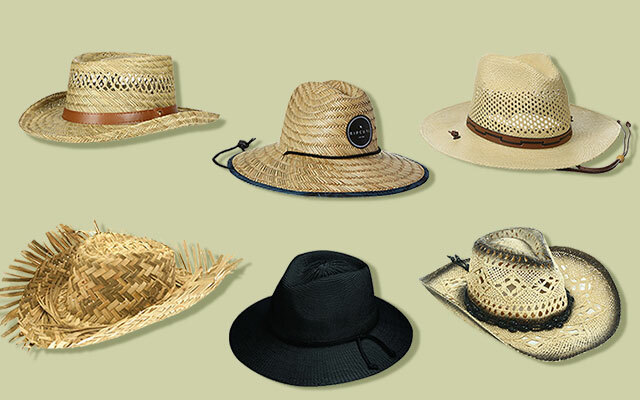 First of all, the materials of this straw hat offer the maximum protection again the harsh sun rays. Second of all, the brim of this hat is extremely wide so that it offers a great coverage for your face. Not to mention that it comes with an adjustable chin strap lanyard to keep the hat on your head even when the wind is very strong. Furthermore, the brim of this hat is very stiff so that it will not become floppy in any kind of weather. Also, the hat is very well ventilated with a mesh area to keep your hat cool all of the time. Cons: In my opinion, the lanyard should be a little bit longer. When To Wear This Hat? This hat with its excellent UV protection and good ventilation is a great choice for you to wear with your outdoor work wear. You can wear this when you go gardening tasks as well. Other activities in which you can wear this hat are farming, boating, and fishing. Its Main Features: This hat is made of 100 % of straw hat with a wide range of colors and woven pattern. There is also an eye-catching statement piece of hat band and a sweat absorbent inner band. 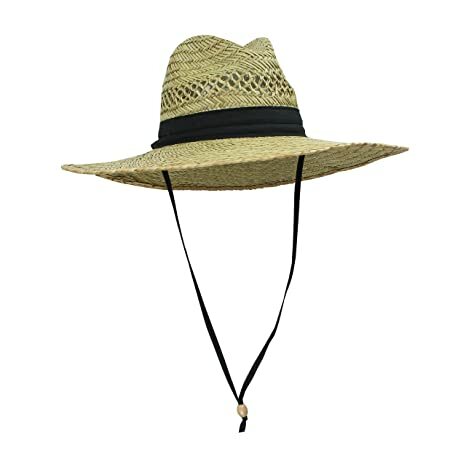 Pros: One of the most significant features of this woven straw hat is that it has a sweat absorbent inner band. This band helps to prevent moisture inside your head and keep it as cool and comfortable as possible. In addition, there is a wide brim to help shield and block harmful sun rays from the eyes and face. Thanks to the adjustable chin strap, you can easily adjust it to make sure it stays fit on your head. And lastly, the hat is made with excellent craftsmanship for a firm and solid construction. Cons: Keep in mind that this hat should not be folded I try to fold it and pack it inside my bag to carry it with me when I go travelling but when I take it out, wrinkles appear on the hat. When To Wear This Hat? 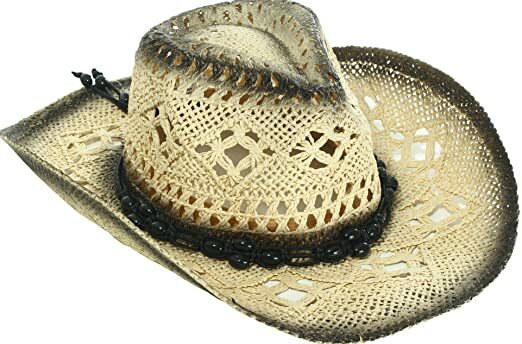 You can wear this style of straw cowboy hats as a great everyday casual wear or as a costume accessory. The natural tone of this hat makes it very easy for you to pair this hat with other pieces of your clothing. Its Main Features: This type of stetson straw hats is made of the genuine Panama straw featuring the Ecuadorian Panama hat design. The chin cord of the hat is made from leather with toggle to help you adjust the length of the chin cord. The tear drop bubble crown is a 4 1/2 inch tall pinch. The brim is 3 inches wide. Pros: There are many things that I love in a straw hat made by Stetson. First is the high quality material with the UV protective shields in the crown and on brim. The UV protection underbrim provides ultimate protection from the sun. In addition, the chin strap feature makes it easier and more comfortable for you to wear it throughout your activities. Thirdly, this hat is very unique in design with a mesh area around the top of the hat. This part helps to ventilate the air around your head and make it breathable as well as comfortable for you to wear the hat in hot summer days. Cons: The brim of this straw hat is a little bit floppy. Imagine that you wear this hat and go to the beach. The strong winds will make the brim go up and down covering your eyesight. When To Wear This Hat? 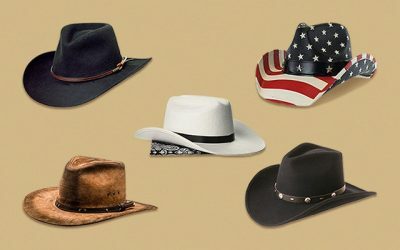 Why the majority of Stetson hats are formal hats and they should be worn with formal wear for formal occasion, this hat is quite informal. So, you should wear it if you want to show an active outdoor style. 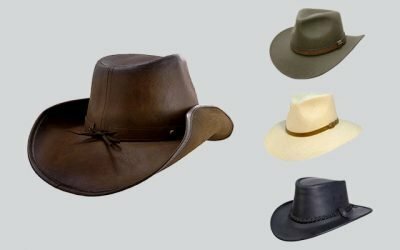 Here is the list of some of the best straw hats that you can find on the market. You can wear different types of straw hats to different occasions such as to the beach or to a Western themed party. You can choose a straw hat as a mean of protection for your face when you take part in some outdoor activities such as gardening and fishing. No matter what style, design, and purpose that you want in a straw hat, make sure you pay attention to the material and the construction of the hat so that it is worth your initial investment. Also make sure that you can take a good care of your straw hat so that it can last for as long as possible.